While this summer may have felt like fall across much of the eastern half of the U.S., worldwide the overall picture was a warm one. This August was the warmest August on record globally, according to newly released NASA temperature data, while the summer tied for the fourth warmest. 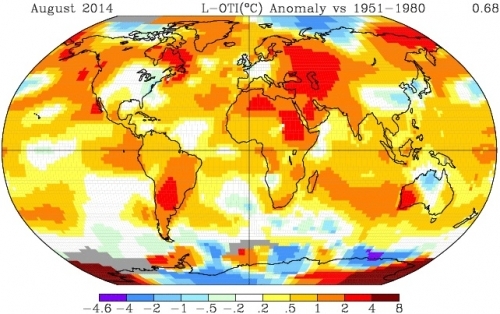 Temperature anomalies (in degrees Celsius) of various regions around the world in August 2014. Central Europe, northern Africa, parts of South America, and the western portions of North America (including Alaska) were just some of the spots on the globe that saw much higher than normal temperatures for the month. Large parts of the oceans were also running unusually warm. “For the past few months we've been seeing impressive warmth in large parts of the Pacific … and Indian Oceans in particular,” said Jessica Blunden, a climate scientist with ERT, Inc., at the National Climatic Data Center in an email. This warmth was a large factor in August’s chart-topping temperature, which was 1.3°F higher than the 1951-1980 average for the month according to NASA data. NCDC also calculates how much a given month’s temperature varies from average, but their August data won’t be released until Thursday. However, “we're expecting pretty impressive statistics for August,” Blunden told Climate Central. By the NCDC’s measure, this will have been the 38th consecutive August and 354th consecutive month with a global average temperature above the 20th century average, a mark of how ever-rising greenhouse gas levels in the atmosphere are warming the planet. Whether or not the El Niño struggling to form in the tropical Pacific — which is characterized by warmer-than-average surface waters — has played a part in the summer warmth is hard to tease out from the broader ocean warmth at play, Blunden said. That El Niño, originally expected to form this summer, but now given a late fall potential start date, could still impact and raise 2014 temperatures, though would likely have more of an effect on 2015. The record-setting August capped off what NASA data shows was the fourth warmest summer on record globally, coming in 1.12°F above average. That puts it in a tie the summer of 2005, but behind 2011, 2009 and 1998 by NASA’s rankings. NASA, however, had a lower ranking for July than the NCDC did. NASA put it as the 11th warmest July on record, while the NCDC ranked it fourth. The two agencies use different methods of dealing with their data, and NASA includes the poles, while the NCDC does not. Both Schmidt and Blunden said that this can mean that monthly rankings that seem to be quite far apart can actually be separated by only small temperature differences. “Just because the spread in ranks seems big does not mean there is a big difference between the anomalies,” Blunden said. The monthly temperatures do feed into the larger decades-long warming trend, which Schmidt says is the more important trend to watch. The ocean conditions that have fueled this warm summer could change next year, but “the more the run of warm months continues,” including this August, the larger the long-term trends will be, he said.